inviting in more natural light than ever. The possibilities are endless, giving you doors that perfectly fit your lifestyle. 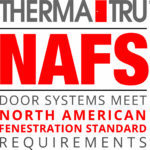 The architectural beauty of a Therma-Tru door is easy to see. With the look of real wood, rich panel details and intricate, handcrafted decorative glass designs, there are thousands of possibilities to suit the style of a home and express a homeowner’s personal style. Find the right style for any personality. Choose from premium fiberglass entryways in four wood grains or a smooth surface that all rival custom wood. The industry’s first fiberglass door delivers the look and feel of real Mahogany and Oak with excellent performance and value. A smooth, ready-to-paint fiberglass door that offers excellent performance and value. A contemporary series of door styles and glass designs that can be combined to make a bold statement. Bring style and affordability together to create very attractive results with our steel doors. Asked us about our Combo Door and Garden Door Systems. Whatever the design or architecture of your home, wood doors inspire a feeling of warmth and permanence. That is why our Wood Stile & Rail doors are designed to give you dependable performance and lasting craftsmanship. Depending on your region, we offer a variety of superior Wood Stile & Rail doors to meet your design needs as well as your budget. Please contact your Alliance Door Products representative for more information.